Well, officially the release isn't till tomorrow, but I figure the CPC community deserves a headstart. 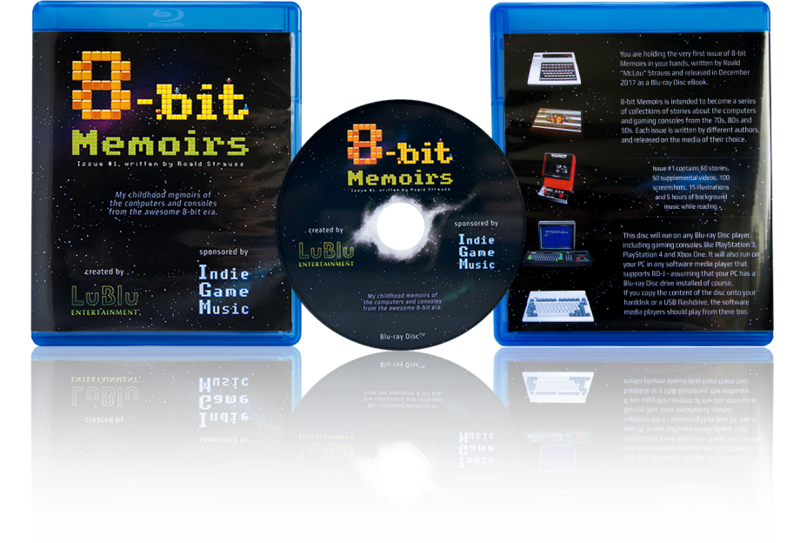 Afterall, the CPC definitely plays the main role in 8-bit Memoirs. (If you don't want 23 gb taking up space on your harddisk, you can choose to put it on a USB stick instead). I can also send you a USB version for 23 Euro if you prefer, but you'll have to send me a PM about that. I’ll try to give it a go during the weekend. I’ll be using VLC as I’m on OSX, will look for a better alternative. VLC developers has been notified of the critical bug, so maybe they'll fix it in a nightly build in the near future. I have worked around all other minor bugs in VLC, but I can't do anything about the one that makes the app disappear when the playlist goes to the next track. Until they fix it, you can just press SPACE to pause the music. Then you can still browse and read the stories - just without background music. Holy cow I've been looking forward to this! Thanks so much for all of your phenomenal efforts in getting this done. I'll download it over the weekend and have a perusal! Great piece of work, just looked at the vid and so on. Great thing! Blu-ray arrived yesterday, only managed to get a brief look. I can only imagine that your home has no furniture in it due to the amount of hardware you must have used! Very much looking forward to having a more detailed and pleasurable look thru it over the next few days. Glad you like it Peter. Hope it'll bring you lots and lots of nostalgic relaxation! Meanwhile, I have added an option to buy a "budget version" for 7 Euro. This is a plain disc with a white mat surface. No print and no case. For those who want to see the project but doesn't want the Collectors Edition and doesn't want to download. Ah darn. I'd love the disc version because of the case and all, but I've got no drive to play it on (my laptop used to have one until I ripped it out in favor of a second HDD). Torn! And no PlayStation 3? PlayStation 4? Xbox One? Popcorn Hour C200 or C300? I have been doing a lot of researching these days, looking for devices that should be able to play Blu-ray ISO files. And Kodi has come up a lot indeed. But I think it matters on what platform it's running. There seems to be a lot of Android TV Boxes nowadays. Some run Kodi, others run somethings else, but they all seem to be able to play Blu-ray ISO files with full Java support. That is a positive surprise. I've only tried once with Kodi a good while back, installing it on a Rasberry Pi, but I had no luck playing my ISO back then. We'll have to see. I've tried Kodi BR playbak on my Nvidia Shield TV and it was all fine, but it was just a disc's FS (IIRC) containing just a movie. Supposedly it can do ISOs too, but I haven't tried it yet. Sadly neither Nvidia Shield nor Plex can handle the Java stuff. They'll just play the videos on the ISO. But you can use VLC on your PC. It does have a few bugs at the moment, but I'm in close contact with one of the developers, so hopefully they'll be fixed soon. Oh, bummer. I really didn't want to involve my PC/laptop, I wanted the full laid-back experience, but oh well I guess! My post on previous page with the full list updated. I've tried Kodi BR playbak on my Nvidia Shield TV and it was all fine, but it was just a disc's FS (IIRC) containing just a movie. Supposedly it can do ISOs too, but I haven't tried it yet. According to rumours, Kodi v18 (Leia) should have Blu-ray ISO supprt with full Blu-ray menus. I've tried the nightly build briefly here on Ubuntu, but didn't have much luck. Well v18 is far from ready of course, so there's hope! I really liked what I saw in your preview. My newest console is a Xbox360 and I have no blue-ray player yet. I will probably get both in time. Downloading..
Well, as mentioned, you can always use a nightly build of VLC to view it on your computer, unless you have one of the hardware media players listed on the previous page, which would be a better choice because of the current bugs in VLC. Otherwise you could consider buying a used Blu-ray player. They can sometimes be found for 7 Euro or so. (I've bought a lot of them for testing purposes). There is really lot's of stuff to explore. Great piece of work! Thank you very much!!! I've mentioned a few times how much text there is and how many hours of music there is, but I actually didn't count the number of hours of video there is till after release: 9 hours! I was a bit surprised by that amount myself. The full list on page one has been updated. I've been testing the ISO with the nightly builds of both VLC and Kodi, and the playlist issue seems to be present with both. This indicates that the bug is somewhere in libbluray. I have mentioned the problem on their mailinglist, but I have a feeling it's of low priority to them. Time will tell. I can't do any more now. Damn, I want to be a celibate again, or not ! I don't have an excellent internet connection, I simply can not download the 22gg. I never let my computer turned on long enough, and the Retry system doesn't always work. I've tried downloading the iso 4 or 5 times, never went through. Is there a Torrent available? It would be very useful to me! There is one on the way. It was supposed to be ready at the time of release. SceneSat was going to handle it. But then had a major crash just after release, and I think they're still trying to get everything back online. Just bad timing. If anyone else has created a torrent, feel free to share. Otherwise I can snailmail you a USB for 20 Euro if you want. (Limited supply). It's all right, I can wait for the torrent. Thanks! Page created in 0.303 seconds with 105 queries.